“Critical Mass” Is the minimum amount of fissile material needed to maintain a nuclear chain reaction. This is not a physics lesson but the dynamics described below are similar. Critical mass controlled, generates heat – uncontrolled, an explosion of massive magnitude. Critical mass of sorts occurs when our unsuspecting spouses finds out about our gender non-conformity. If you are among the few who told all and owned up to our activities before a committed relationships occurred or marriage, then as they say “god bless”. You did the right thing. In hindsight, I should have. It cost me the many years of trust I had built. We are very good at hiding and withholding. I learned very young that when I took out my mother’s dress to play, I had to remember where it was hung, how it was hung and which buttons were open and which were closed. Details so I would not be caught. As the outfits became more elaborate so did the amount of details to remember. To my knowledge I was not caught nor ever questioned on my activities. We carry that level of hiding forward into our adult lives by keeping our female wardrobe at storage facilities or locked in the attic/basement. We are good at hiding but know that being caught is likely and over time, inevitable. I kept it hidden for almost 20 years. Did I inadvertently leave hints and make mistakes? Yes, we all do. 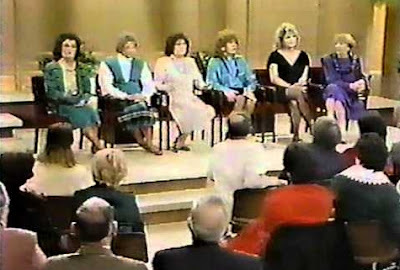 I had been out of town and just by chance watched a Phil Donahue show that had a discussion on crossdressing. They were all well put together girls and several wives. One of which was JoAnn Roberts who was an excellent champion for us. I watched and wished that my wife could be as understanding as the spouses on stage. I returned home that very day. After dinner and kids all in bed, my spouse and sat on the sofa to just get caught up on the week/days. One of the things that came up was she also had seen the Phil Donahew show. “Oh boy here it comes” – I listen quietly. She told me about heterosexual men that dressed up. How good they looked and how their wives accepted them. Some were professionals and lead otherwise normal lives. She also told me that in the group, there was one and his wife did not know. He kept it hidden. Here was the best opportunity ever to come clean – tell all. I took a deep breath and started. “You know many spouses know everything, but many times choose to ignore the obvious.” Another deep breath – slight pause to let that sink in. Before I could start back, she quickly changes the subject. The moment had escaped me. I did not have the courage to start again. Several years later critical mass occurred and there was no denying the obvious. I had missed a detail and was caught. I was relieved – she was not. I expected her to understand something, in one hour, that I had spent some 40+ years trying to understand. This critical mass was not of the controlled type. My relationship did not come to an end that evening but it was damaged. Note to younger self: You will eventually be caught. Do have the courage to tell, before being caught. For me this was hard to write - How did your critical mass occur? What outcome? Like you I took great care when borrowing my mother's clothes. I sort of knew I liked dressing but back in the dark ages I had no clue about T issues. During my youner years (actually until recently when we became empty nesters) I have had a very busy life. I worked all through high school and college and also participated in many school activities and sports. I worked full time all through grad school and took a job with 70-80 hour work weeks and sporadic travel. At peak work times I barely had time to get home shower, grab some sleep and get back to work. I was married at 21 so I really did not have a firm grasp on my T issues but as the emerged over time I started to amass a wardrobe hidden in travel bags at various spots around the house. When I hit the road I took a change of cloths with me. Of course, my practices did not escape my wife. Her big fear was that the kids would find out. with the kids gone she is more accepting of my dressing around the house but is very fearful if any friends, family or co-workers were to find out my 'secret'. To follow your lead I suppose my T fuse is still fizziling and critical mass has not been realized in either a controlled or uncontrolled fashion.